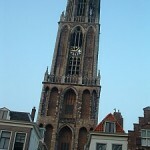 The city of Utrecht was founded by the Romans in 47 AD. 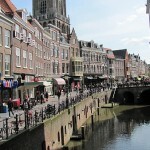 It experienced a time of growth especially in the 16th and in the 17th Century, and today it is a popular destination for a day excursion from Amsterdam. If you travel by train from Amsterdam, you can reach Utrecht within less than 30 minutes. From Utrecht there are trains headed of in all directions in the Netherlands, so if you just spend some hours in Utrecht, you can easily head on for the next city with train from here. The landmark of Utrecht is the Dome tower from 1382, which is an attraction you need to see if you first spend some hours in Utrecht. Another nice thing to do in Utrecht is simply walk around in the city center. 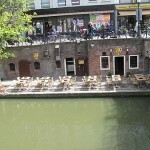 Here you can enjoy walking along the canals while shopping, and maybe grab something to eat just next to the canal (recommended) – see picture below for an example! 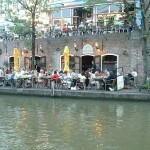 One restaurant located next to the canal is Gauchos, which can be warmly recommended. Utrecht has quite some museums, so if you would like to spend some hours in museum, you can for example choose the railwaymuseum in Utrecht.